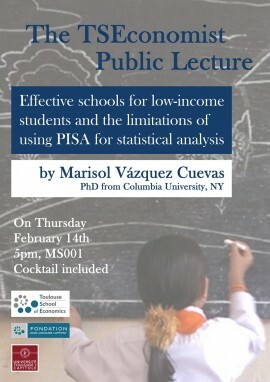 The student association TSEconomist is glad to receive Marisol Vázquez Cuevas (Executive Director of the Maison Universitaire Franco-Mexicaine) who will present a public lecture on "Effective schools for low-income students and the limitations of using PISA for statistical analysis" to TSE students on Thursday 14th February 2019. "Understanding what schools can do to help low-income and high-achieving students succeed academically was one of the prime motivations of this study. Low-income students perform in the lowest quartiles of standardized tests and their future is not promising. Through a thorough quantitative and multilevel analysis of the Programme of International Student Assessment (PISA) 2009 and the Formato 911 databases of Mexico's results, I identified the different factors that helped low-income students succeed at school. However, I found that PISA has limitations in terms of the statistical analysis we can perform, and the implications it has in education policy. In this lecture, we will review those topics and obtain an understanding what we can and we cannot do with the OECD PISA databases. "